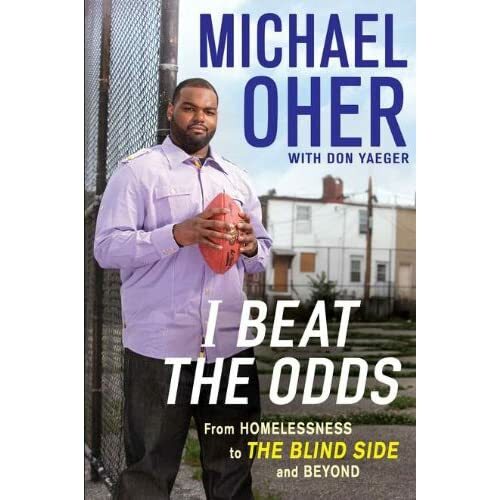 NPR interviewed Michael Oher to discuss the motivation behind his new book, ‘I Beat the Odds: From Homelessness to The Blind Side and Beyond‘. Through the 2009 blockbuster The Blind Side, the nation learned Michael’s story of growing up with his 11 siblings in Memphis, having been born into a bad situation with a crack-addicted mother who lived in a neighborhood caught in the cycle of youth dropping out of school, joining gangs, and living a life of violence. Michael is now an offensive tackle for the Baltimore Ravens. During the interview he shared that football was always his number one and that he felt people already knew his life story, so why did he need to write a book? But after receiving thousands of letters from youth who were growing up in similar situations he realized the significant impact he can have on others by continuing to share his story. As Michael began researching the foster care system to write his book–even after growing up in the foster care himself–Michael couldn’t believe the poor outcomes of these youth. He shared that this he wanted his book to be more than his life story, but rather a guide for youth and adults who impact the lives of youth in foster care.